For better or worse, 1999’s “The Blair Witch Project” is single-handedly responsible for creating the “found footage” subgenre of horror and suspense films. This style probably hit its apex with the 2008 smash hit “Cloverfield“, and has been delivering increasingly diminishing returns since, all the way through the umpteenth “Paranormal Activity” installment. 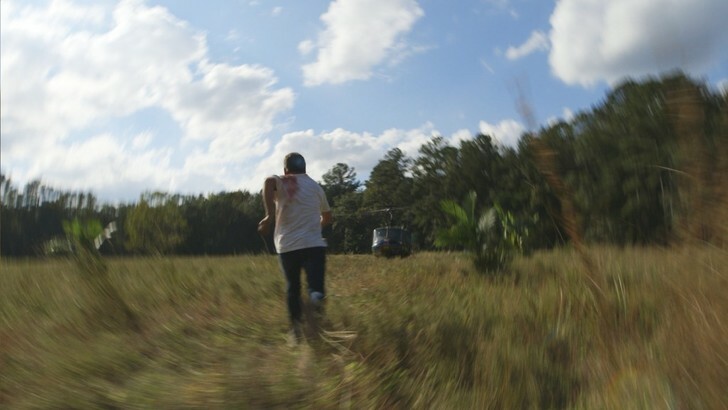 In a surprising departure from his normal milieu, indie suspense maven Ti West (“The House of the Devil” and “The Innkeepers“) has decided to throw his two cents into this field with the half-baked, low-budget cult mania shocker “The Sacrament”. The film opens with fashion photographer Patrick (Kentucker Audley), talking to his editor friend Sam (AJ Bowen) at VICE magazine about a strange letter he received from his sister Caroline (Amy Seimitz). In the letter, she tells Patrick to come see her at this new commune she currently resides in, a peaceful and healing place where she has been able to kick her addictions to drugs and alcohol. Sensing a story, Sam and Patrick team up with their cameraman Jake (Joe Swanberg) and head out to an unnamed country (somewhere in Africa?) to find Caroline and see what exactly is going on at this place. What follows is basically an extended episode of Vice News, as the entire film is footage from Jake or Patrick’s cameras. They arrive at Eden Parish to find anxious men with guns guarding the gate, a tense situation that cools off once Caroline arrives and invites them all into the compound. As usual, everything appears to be hunky-dory, everyone lives in perfect harmony free of prejudice, pain and strife, in this religious-colored wonderland overseen by the mysterious Father who has led them all to this promised land. Sam isn’t buying into it of course and wants to interview the Father, and gets the chance to do so in front of the entire congregation. It is this extended interview with the Father (Gene Jones) that is the centerpiece of the film, and showcases West’s strengths as a filmmaker, namely building suspense. It’s obvious that there is something wrong behind the glassy-eyed veneer of the compound, but the Father plays his cards close to his vest and with some religious crowd-pleasing doublespeak, ends up flummoxing the savvy Sam. After the interview, a mute girl named Savannah hands Sam a note: PLEASE HELP US. There are a multitude of problems that plague “The Sacrament“, the first being that it is basically one giant commercial for VICE magazine and its television show. I understand that smaller independent films rely on outside funding and sponsorship, but this is blatant product placement at its worst. Also, in spirit with the “found footage” genre, the film insists that these events actually took place, a tired concept that might have held power back in the “Blair Witch” days but loses potency in these days of instant Google searches. Produced by Eli Roth, master of the “horror in foreign countries” “Hostel” films, “The Sacrament” could have worked along those lines, or offered a fresh take on the cult genre. But cults in film have been covered quite well lately, starting with the documentary “Jonestown: The Life and Death of Peoples Temple“ and recently with the excellent indie dramas “Martha Marcy May Marlene” and “The Sound of My Voice” (which has a similar plot in which two freelance journalists go undercover to investigate a mysterious cult). 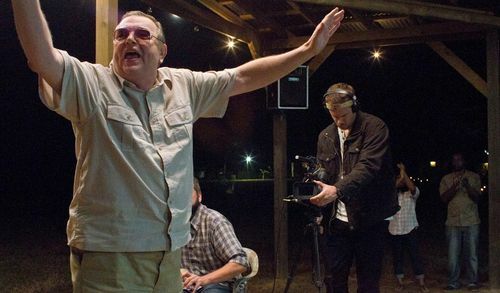 “The Sacrament” fails in that it doesn’t add a single new thing to this genre, and instead uses the tragedies of real life events like the Jonestown massacre for cheap horror effect. Where Ti West does succeed, as seen in his previous works, is in building suspense. The first half of the film has some creepy, nail-biting moments as we identify with the journalists as “outsiders”, trying to figure out what the heck is actually going on in the compound. 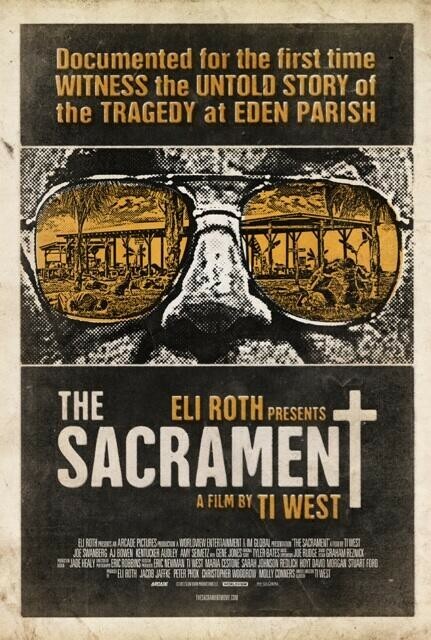 But once the veil is lifted, “The Sacrament” falls back on tired horror movie tropes and unoriginal sequences that have been used far too many times to be effective, and becomes an unfortunate letdown from a previously reliable and promising director.